In June 2003 I was flipping through the gallery section of the latest issue of Climbing magazine and came across a stunning photo of an impressive formation. 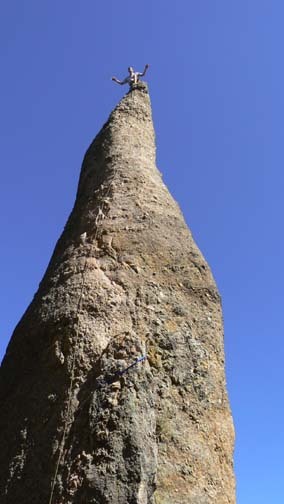 The photo showed a guy climbing a very narrow, isolated spire to a tiny summit. 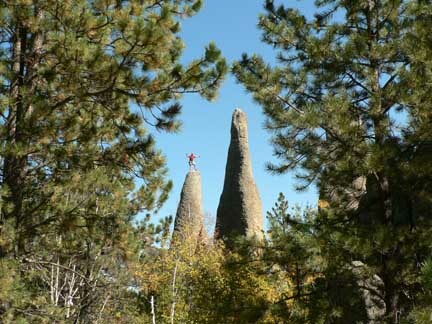 Upon further review, I discovered the name of the spire was Tricouni Nail in the Needles of the Black Hills of South Dakota. I knew nothing about the difficulty of the climb but the climb immediately went onto my mental list of climbing objectives. The rock looked featured and fun and the summit perch was sure to be exhilarating. I did a little more research and found that the route was first ascended by Royal Robbins in the 70s and is rated 5.8. I also read that the climbing in the Needles has a reputation for being thin, run-out and committing. Nonetheless, when Bill and I began planning our 2006 two-week fall climbing road trip to Rocky Mountain National Park and Devil's Tower, I placed Tricouni Nail on the itinerary. I was psyched! After visiting Mt. Rushmore, we drove into the Needles with little more than a print-out of the area and route information from MountainProject.com for beta on the climb. After driving through the tunnel at the Needles Eye we drove up and down the switchbacks of the road looking for the Tricouni Nail. We knew it was less than 50 feet from the road but there were so many damn cool spires right next to the road that we had a bit of time locating it. A short hike around the Ten Pins area was all we needed and we located the climb. 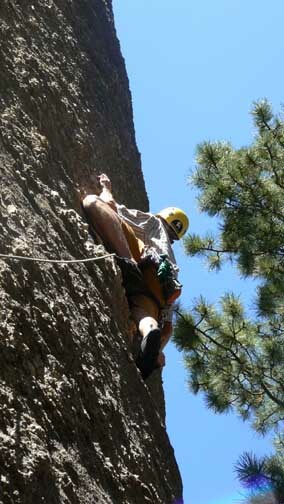 The climb is about 70 feet and is protected quite well compared to many other climbs in the Needles. Three pitons, a sling around a large flake, a crack for a nut placement and two bolts offer protection to the summit. I tied in and started up, clipping the three solid-looking pitons on the way up to the flake. There was already some webbing on the flake so I clipped the webbing with a quickdraw and stood up on the flake. The first thing I noticed about the rock here was just how sharp it was! Very positive, small quartz knobs protruded from the granite. Good stuff! Leading up above the big flake past the ring bolt. From the top of the flake a left-angling crack sucked a #9 BD wired stopper perfectly and I moved up to clip the ring bolt above the crack. From there the route moved right onto an exposed face with some great features up to the last bolt. This area was the crux in that it was committing and exposed but the features were very positive so it wasn't too bad. Above the last bolt it was a bit run-out to the summit but the climbing was easier with some very large holds so it wasn't too spooky! At the summit I threw a double-length runner around the middle of the three summit horns and a single-length runner around the western-most horn and clipped into those before calling, "Off-belay!" I adjusted my clove hitch to give me enough slack to stand on top and then stood up. What an awesome perch!! The top is only about three-feet by one-foot wide! Many other awesome spires surround Tricouni Nail and after experiencing the exhilaration of standing on this one, I wanted to stand atop all the others! On the awesome summit of Tricouni Nail! I lowered from the slings so that Bill could lead up the climb next. He made nice work of the climb with a bit of hesitation at the crux area I described earlier but was on top in short order. Once he was off-belay on top, I seconded him to clean all the gear and then we readied ourselves for famous simul-rap from the summit. In order to get down we through one end of the rope on the north side and one end of the rope on the south side draping the mid-point of the rope between two of the summit horns. We got on belay, one of us on each side of the rope and used each other's weight to counter balance ourselves and rappelled down opposite sides of the formation. 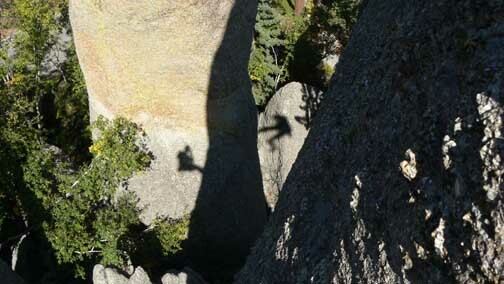 This was our first simul-rappell but we found it to be very effective and quite easy. Awesome! No one was around to take our picture during the super fun simul-rap so we photographed our shadows. I'm the one on the right! 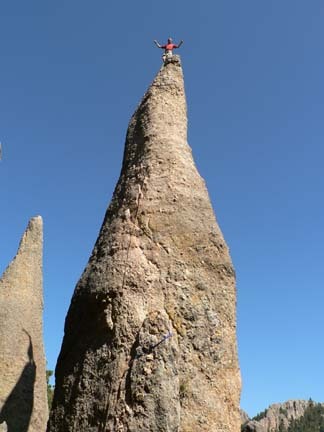 We spent the rest of the day climbing on a number of the other spires as I was hooked on the spire climbing! One spire had a summit register on top and I badly wanted to read the entries in it. 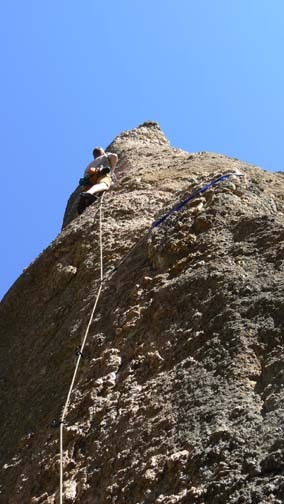 Not having a guidebook for the area or knowing anything about the climbing, I tied into the rope and headed up. One piton led to a bolt but beyond that bolt the climbing got steeper, harder and more run-out. Trying to climb End Pin, 5.10+ X. I was unsuccessful, damn it! I tried a couple of times to get up but was unsuccessful. After an eight-foot fall, I gave up. I think I could have made the moves but I couldn't see any protection further up and didn't like the 20-foot run-out to unknown territory! 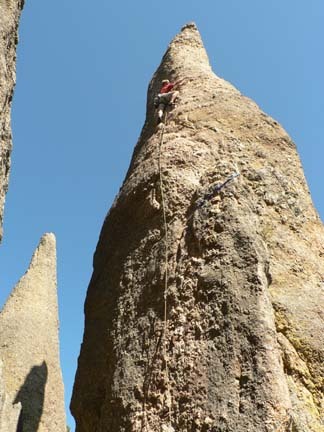 As we later found out, I was attempting a 5.10+ "Needles testpiece" on End Pin--Very run-out and very hard for the area. I didn't feel so bad about not making it but still really wanted to read that summit register. Next time! Bill stands atop an unknown spire right next to Super Pin. Written by Jason Halladay on 15 September 2006 for TheMountainInstitute.com.